OPTGHAR.com is a US-based hi tech job portal, with across-the-board options for OPT students, employers, and trainers. We are dedicated to assist F1 visa students and job seekers to get placed in great IT jobs. Also, we assist Optional Practical Training (OPT) / Curricular Practical Training (CPT) students, and international students seeking internships and entry level jobs. As a student you can take advantage of our online it training courses on latest technologies, placement services and post your resume in our website. For trainers, we provide an opportunity to post their training schedules online in our website; with our interactive system trainers can look out for training aspirants and students. Employers can take advantage of our huge resumes database to search out for suitable persons for their organizations. Our resumes database updates with new resumes every day. OPTGHAR is a kind of single stage for job seekers, trainers, and employers. 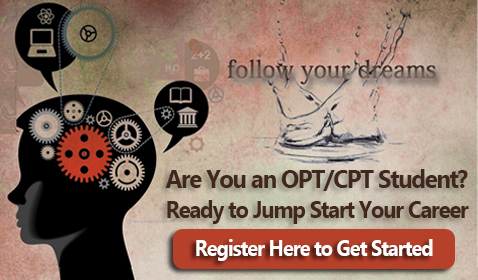 OPT CPT Job seekers can search for IT jobs, OPT employment,CPT Jobs, online training on latest technologies, internships, work placements, and entry level jobs. Apart from this, you can post multiple resumes to focus on various skills you have, and find employers who can sponsor you H1B jobs in your relevant field. Trainers can post online training and placement programs, search for training aspirants and send messages to students through our OPT job portal. Employers can post unlimited jobs, search for the right candidate through our vast resume database and post H-1B Sponsorship / GreenCard (GC) adverts in our website. You can start your OPT CPT job search at OPTGHAR, by registering in our website, posting multiple resumes and keeping track of those resumes on a regular basis. Since, the OPT students can have access to technical experts and online trainers, they can acquire training in their desired technology for getting a job in OPT. Moreover, many employers post jobs on a daily basis, so you can search for OPT jobs in your relevant fields in our website. Additionally, we get you the latest updates on immigration news and laws, current job market and interview questions to gear you up for interviews. Also, OPTGHAR, serves as a social network for many students joining the website community to discuss the OPT job opportunities in USA.